Today I'm sharing the second installment in a three-part feature on writers Chadd VanZanten and Russ Beck, authors of On Fly-Fishing the Northern Rockies. Chadd is a professional editor and has published his writing in online journals and print anthologies. Russ teaches writing at Utah State University, is the recipient of the Western Literature Association Frederick Mannford Award, and edits braidedbook.com and howsmallatrout.wordpress.com. Their collection is a humorous and introspective look at the rules of fly fishing. Click here to read part one and check back tomorrow for part three! Your book On Fly-Fishing the Northern Rockies: Essays and Dubious Advice (History Press, 2015) is a collection of essays about fly-fishing, but told in a way that incorporates broader themes about life and humor. Is this a book that non-fishers can enjoy? How would you pitch the book to someone like that? Chadd: We certainly hope non-anglers can relate to material if it’s a book they happen to pick up. A few of our acquaintances who have read it said they enjoyed the writing. 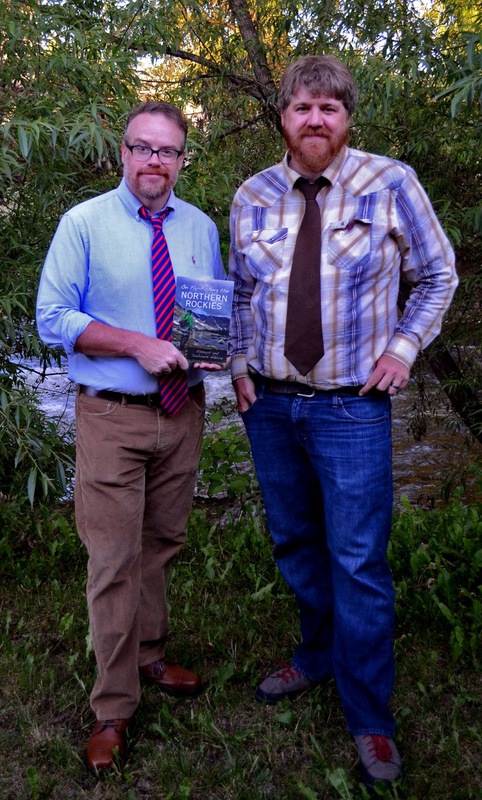 I would stop short of saying the book is universally accessible to those who aren’t interested in fly angling. 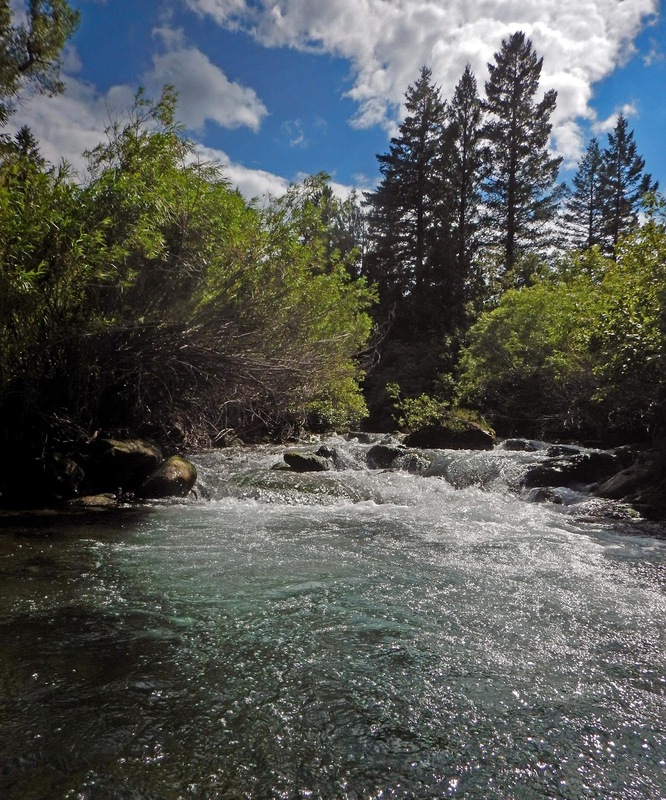 Many of the essays raise the question of what it means to fish, and there are lots of themes and moments that those who are into fishing will relate to much better than those who don’t. Russ: I hope it's a book anyone can enjoy. I think I would tell the uninitiated that it's a book sort of about fishing (I think a total of, maybe, five fish are landed in the whole book). What I've loved reading in the early reviews of the book is that people seem to think it's more about friendship and companionship than it is about fishing. I didn't know that when we wrote it--but I like it and buy it. Chadd: We did not pitch the book as anything but a book for fly anglers, and it the book was published as such. No real efforts were made to broaden the appeal of it or open it up to other markets. I think the best I can hope for is that a few of my non-angling acquaintances or family members read the book and at least appreciate the writing and the stories. Had you ever considered writing short stories or a novel based on your love of fly-fishing or were these essays the first incarnation of your ideas about the sport? Chadd: In my writing there is a strange compartmentalization right now. 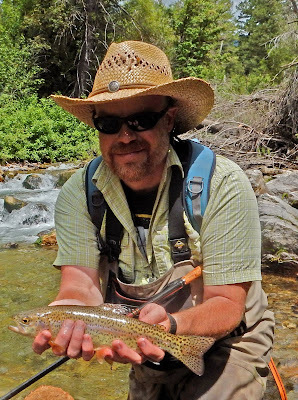 I may not always be this way, but right now, fly fishing is the only creative nonfiction topic I write about, and it’s a topic that I’ve never written any fiction about. I’ve never really written any nonfiction about anything but fly fishing, and I’ve never written any fiction about fly fishing. On the other hand, five or six years ago, I never thought it’d be writing any nonfiction at all, so, I’ll keep those options open for now. 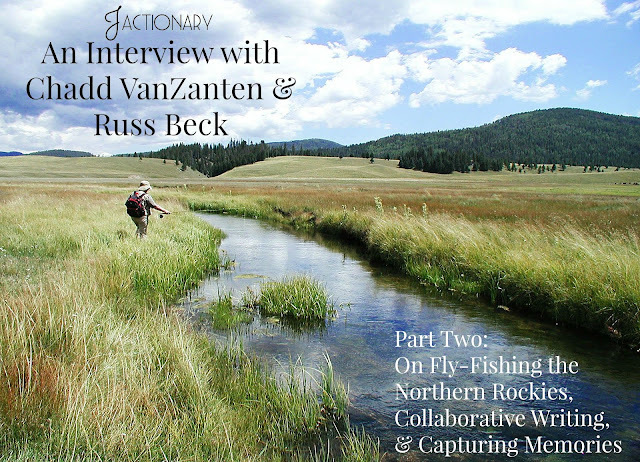 Russ: To paraphrase Scott Carrier, writing about fly fishing is like trying to tap dance and fart. It just doesn't really work. I think the only way I can see how to write about fly fishing is head on. Otherwise it spirals out into gauzy prose that makes fishing into something it's not. Usually writing is viewed as a solitary event. The same could be said of fly-fishing. Did you experience difficulties in collaborating on this project? How did you go about outlining, drafting, and editing the collection? Were there any essays, rules of thumb, or other humorous tidbits that did not make the cut into the final volume? Russ: A couple--but the book is better for it. Chadd: To me the collaboration looked like a really chaotic process. Some of the essays that appear in the book were already written and had been published elsewhere, but some were rough drafts or incomplete pieces. Others were only ideas that we’d talked about while fishing. So, Beck and I would get together in the evenings and just start reading all of our material together, in no particular order, and then we’d decide if and where each essay fit into the book. Then we’d work on writing between meetings. Some of our writing didn’t need much work at all, but there were also pieces that were dropped from consideration altogether. For example, there is one essay that I wrote a few years ago that I thought I was quite proud of, and I’d assumed it would be in the book. But when it came time to look through it, I realized it just wasn’t suitable for this project—it was much longer than any two of the other essays we were considering, for one thing. And because it had been written so long ago, it just didn’t sound or act like anything that I’d written more recently. So, it got dropped. Beck had ideas or rough drafts for essays that were collapsed together or morphed into new essays. So, it was this very plastic, haphazard exchange that eventually resulted in a full collection of good essays. I’m still not sure how and I haven’t explained it very well. Basically, Beck and I met every week for a while, we read our material and talked a lot, there was some beer and sometimes fishing involved, and then some time later there was this book. Russ: We've worked together longer as writers than we have as anglers--so the collection really seemed natural. Basically Chadd's been my second (or third) reader on everything I've written in the last ten years. And we collaborated on a blog first. The book seemed really easy. I can honestly think of no hang-ups. The book also includes over 70 photographs. How did you go about picking and choosing which images to include? Did any get scrapped that you wish had made it into the final version? Does the high number of images suggest that you two were always “camera ready” while fly-fishing? Is the sport ever not photo-worthy? Chadd: The History Press really likes to have photographs in their books. Most of their books to this point have been very historical and factual, with lots of photos of buildings and people and artifacts. Our book is a departure for them—it’s just personal essays that do not require illustrations or photos—but they wanted the photographs anyway. Luckily, I had started taking photos of our fishing excursions years earlier. 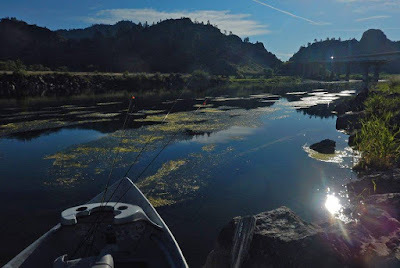 At first it was a way to capture memories of places and fish, purely for my own enjoyment. Later, when Beck and I started a blog, I had accumulated a collection of photos that were good enough to liven up the blog visually. After that, I took pictures expressly for the blog, and the collection grew a little. All of that turned out to be quite lucky, because I’m not sure if The History Press would have accepted our proposal if we had not been able to offer photography. Russ: To be clear, nearly every photo is Chadd's. I took a camera for a while but kind of gave up on it (that's one of the reasons we listed Chadd as first author). Plus, Chadd does a really good job of it. There were a couple that got cut because of quality (one of my favorites was a green, fuzzy fly I made for my friend's wedding). Are you a fly fisher or writer? Share your thoughts and tune back in tomorrow for part three!